Prathamastami is observed on the eight day (ashtami) in the month of Margasira (November – December) in Odisha. Special pujas are performed for the wellbeing and prosperity of the eldest child in the family. In 2019, the date of Prathamastami is December 4. Prathamastami is based on the social belief that it is the eldest child who has to look after the family after the death of the parents and it this child who has to continue the lineage or the family tradition. The eldest child is presented new clothes and Kalash is placed on a rice bed before. This symbolizes prosperity and fertility. Sashti Devi is prayed to for the long life of the child by mother and other female members. A delicacy called Haladi Patra Pitha – rice cake filled with sweet stuffing and wrapped in green leaves of turmeric plant before being steamed – is made as Prasad and is distributed. The cake is first offered to Sashti Devi, who is the protector of children. Not only do the turmeric leaves have beneficial antibiotic properties, but the fermentation enhances the nutritional quality of the black gram and rice. And since it is steamed, the food is very light to the digestive process and hence can be consumed by members of all ages. 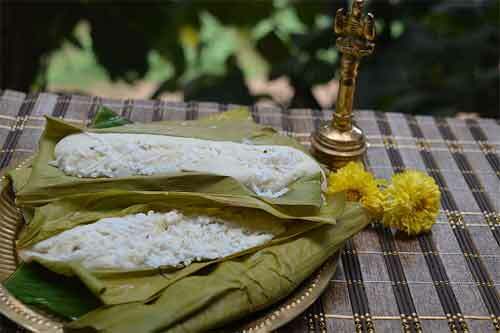 Enduri pitha is another flavoured cake, native to Odisha, prepared during the Prathamastami festival. A fermented batter of parboiled rice and black gram is applied onto a turmeric leaf. The leaf is then folded mid-vain and cooked gently over the steam.